How to stop Bed Bugs and Psychological Effects that can turn your life completely upside down. Could it be that the current bed bug infestation is a sign of the End Times? Perhaps a prelude to 2012? Maybe it’s just another thing we can blame Bush or Obama about? Oddly enough, the White House has developed a serious problem of insect infestation ever since Obama moved in. A good conspiracy theory focuses us Plum Island, New York. A facility there allegedly run by the Department of Agriculture researches animal diseases. However, many believe that it was the site of a Cold War era biological weapon laboratory. Oddly enough, the Army transferred control of Plum Island to the DoA in the early 1950s following an outbreak of foot-and-mouth disease amongst cattle. Since then, some conspiracy experts point to outbreaks of Lyme disease and other bizarre experiments. In the film, “Silence of the Lambs”, the evil Hannibal Lecter called Plum Island “Anthrax Island”. In 2002, the facility was curiously turned over to control under the Department of Homeland Security. Plum Island was even linked to a potential Al Qaeda terror plot when Aafia Siddiqui, a Pakistani scientist, was arrested in 2008. She was found to have a list of “mass casualty attack” targets, with Plum Island as one of the locations. Perhaps even more strange is the weird story of the Montauk Monster, started when the carcass of an unidentified creature washed up on shore. Later, the body of a possible human also washed up on shore. The deformed humanoid was said to have a series of five holes drilled into it’s skull, as if part of an experiment. Montauk has also been associated with other conspiracies, ranging from government psychic research to time travel and even inter-dimensional beings. The infamous ‘Montauk Chair’ is said to be part of a U.S. government experiment with alien technology from crashed UFOs. So what does this have to do with the bed bugs concern? With the current bed bugs infest of homes, apartments, officebuildings and historic hotels like the Waldorf-Astoria? Bed bugs may be part of another experiment gone awry from Plum Island. Perhaps even part of the alleged New World Order plan to reduce the human population to below 500 million people, as depicted on the strange and infamous America’s ‘Stonehenge’, more commonly known as the ‘Georgia Guidestones’. A granite monument which calls for a one-world government and depopulation of the planet of humanity. Are bed bugs, stink bugs and other infestations this year part of such a plan? Who can say? If you have bed bugs, you can be eaten alive from head to toe. Besides this, there are many psychological effects. 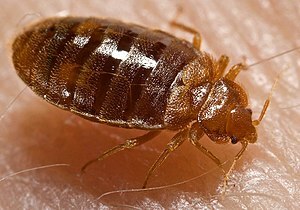 Many people are repulsed by people who have bed bugs. This can be extremely humiliating and can subject you to social stigma. Friends can stop visiting and also inviting you to parties. You can be left alone and completely ashamed. It can turn your life completely upside down. Even in a nice hotel like Vegas, you can be subjected to bed bug bites. This is an infestation problem in the United States, and it can make people feel extremely ashamed. It is similar to the mental disease that can make someone turn into a recluse and a hoarder. It is possible that you simply shouldn’t tell anyone, unless you have the problem taken care of. Honesty may be the best policy, but that will come with a tremendous social cost. Even people at your work will want to stay away from you because they will not want to come near you. If you stay in a hotel, you should avoid placing your luggage on the bed.